Today we wanted to talk about antioxidants. We have already discussed the foods you should be eating for your gut, but what about the foods that protect your cells? Those would be the ones packed with antioxidants, a buzzy term you’ve probably heard before. Antioxidants occur naturally in plant-based foods such as fruits, vegetables, cacao and green tea. Note that animal-based products DO NOT contain antioxidants. While there are thousands of antioxidant compounds out there, you’ve probably heard of flavanols (found in cacao), resveratrol (found in red grapes’ skin), and lycopene (found in tomatoes). Other popular antioxidants include vitamins A (beta-carotene), C, E, and catechins. 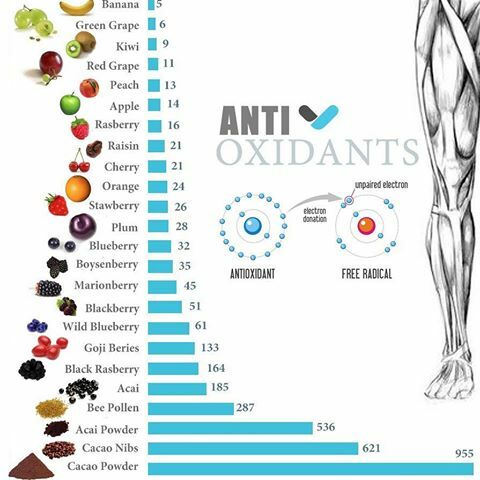 “Oxidants are free radicals that you find in the environment, but they’re also produced naturally in your body,” says Diane McKay, Ph.D., an assistant professor and researcher at Tufts University’s Antioxidants Research Laboratory. Until more studies are done, it is best to get your antioxidants from a diet rich in fruits and vegetables rather than from supplements. Taking supplements in high doses can be harmful. No single antioxidant alone can protect the body. Most people should eat 7 to 10 servings of fruits and vegetables each day. Start by taking a good look at below table and pick your favourite. ← What’s B12 and why should you take it?